Sampling site A sampling site through sea ice on the Chuckchi Sea. Barrow A late winter afternoon in Barrow, Alaska. February 27, 2010. Deborah Bronk and a colleague drill through sea ice on the Chuckchi Sea to take water samples. Nitrogen Snow Ninjas The "Nitrogen Snow Ninjas" strut their stuff. Polar Bear Guard The VIMS research team must be accompanied at all times by a local armed guide to protect against polar bears. "Roxie," a native guide, keeps an eye for polar bears on the sea ice. Snowmobiles The VIMS researchers use snowmobiles to reach their sampling sites on the sea ice. For thousands of years, Inupiat Eskimos have relied on the bounty of nearby coastal waters for their survival along Alaska’s far northern shoreline. Bronk’s research team, which will travel to Barrow Alaska in late January for its first winter field season, is collaborating on the project with colleagues from the University of Georgia and the Skidaway Institute of Oceanography. The 3-year endeavor, with one spring, summer, and winter field season each year, is funded by the U.S. National Science Foundation. The scientists’ near-term goal is to better understand how the extreme seasonal changes that mark the Chukchi Sea affect nutrient inputs and the microbes that depend on those nutrients for growth. Their field site, at 71°N, receives 24-hour sunlight between May 10 and August 2, and lies in continual darkness between November 18 and January 24. Sea-ice has historically covered the ocean surface from late October to late July. The team’s other goal, says Bronk, is to “study how warmer temperatures, increased runoff, and larger ice-free areas will affect the microbial community, and how changes there might ripple up the food web to affect larger organisms and native peoples.” They also aim to investigate how climate change will affect the region’s role in the global carbon cycle. The polar regions are warming faster than anywhere else on Earth, with a rise in the Arctic of more than 7°F in average winter temperatures during the last 50 years. The extent of Arctic sea ice has decreased by more than 30 percent since satellite records began in 1979. A key question for Bronk’s team—which includes post-doctoral researcher Rachel Sipler, graduate student Steven Baer, and field manager Quinn Roberts—is how climate-driven changes in runoff from the Arctic tundra will affect competition between phytoplankton and bacteria for nitrate, a nutrient essential to plant growth. Today, the Chukchi Sea is a shallow, productive water body that supports large blooms of phytoplankton following ice-out each spring and into the long days of summer. These algal blooms nurture a rich bottom-dwelling community of clams, worms, and other filter feeders. Together, these organisms sustain the fish, walrus, and seals that local subsistence hunters harvest for food. Bronk says that addition of humics to the Chukchi Sea will likely shift the focus of productivity from phytoplankton to bacteria—bad news for the many animals that rely on phytoplankton for food, and for organisms higher up the food chain, including the native Inupiat. Bacteria are simply too small for filter feeders to capture. A shift from phytoplankton to bacteria could also further enhance climate change in the region. Today, the Arctic’s coastal zones are thought to be carbon “sinks,” areas where the net result of photosynthesis by phytoplankton is to draw carbon dioxide from the atmosphere into the ocean. With more humics and a shift to bacteria, these regions could become carbon “sources,” where bacterial metabolism drives a net flow of carbon dioxide from water to air, thus further strengthening the greenhouse effect. This type of “positive feedback” is common in the Arctic, where global warming is also reinforced by the shift from sea ice (which reflects solar heat) to open water (which absorbs it), and by the release of methane, a potent greenhouse gas, through melting of permafrost. Headquarters for Bronk’s research is Barrow, Alaska—the northernmost and coldest city in the U.S.—where extremely low wind chills and blizzard conditions are common. The average high temperature for January 25th, the day the VIMS team is scheduled to arrive for their 2011 winter field season, is -10°F, with an average low of -22°F. Winter water temperatures hover at -1.8°C (28.7°F). The city’s harsh climate, remote location, and resident wildlife make fieldwork for the VIMS team especially challenging. 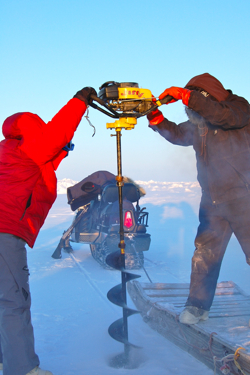 In winter, they reach their field sites by snowmobile, where they must drill though several feet of sea ice to take water samples. During the “summer” field season (which coincides with September’s sea-ice minimum) the team takes to small boats, clad in bulky “Mustang suits” to protect against the frigid waters. 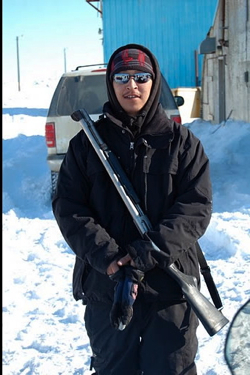 But perhaps the most “chilling” aspect of their research, says Bronk, is dealing with polar bears, which requires that the field team be accompanied at all times by a local armed guide. “They’re a real threat,” says Bronk, “the only bears known to stalk humans.” She notes that each house in Barrow, population 3,982, features two doors—an outer and inner—ostensibly designed to keep out cold air. But this “air lock” serves another, equally important purpose—local residents always leave the outer door unlocked to provide a quick haven for themselves and neighbors in case a polar bear shows up in town. The research team receives field and laboratory support from the Barrow Arctic Science Consortium (BASC), a non-profit that encourages research and educational activities along Alaska’s North Slope. BASC is operated by the North Slope Borough, the Ukpeagvik Iñupiat Corporation, and Ilisagvik College, the local center for post-secondary education.